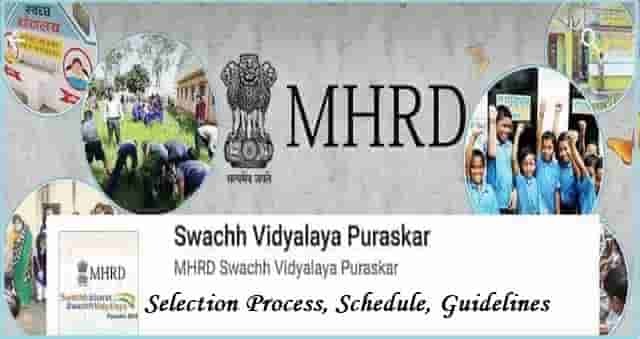 Swachh Vidyalaya Puraskar 2017-18, TS National, State, District level Swachh Vidyalaya Puraskar Awards 2017-18, Selection Process for SVP Awards at District level, District level Swachh Vidyalay Puraskar(Awards) 2017 Selection Process, Schedule. Guidelines on selection of schools for district awards and to compete Stale awards as per GOI instructions. The Swachh Vidyalaya Puraskar was instituted by the Ministry of Human Resource Development, Government of India in 2016 to recognize, inspire and celebrate excellence in sanitation and hygiene practice in schools. The explicit purpose of the awards is to honour schools that have undertaken significant steps towards fulfilling the mandate of the Swachh Vidyalaya Campaign. a. Eligibility for SVP 2017-18: The awards will be open to (a) Government Schools (b) Government Aided Schools (b) Private Schools, in both rural and urban areas. b. Criteria of Evaluation of SVP 2017-18: The performance of the schools will be evaluated under the following categories. Water, Toilets, Handwashing with Soap, Operations and Maintenance, Behaviour Change and Capacity Building. C and DSE Telangana and SSA Telangana :: Rc.No.3623/SSA/R&E/2017. Date:01-12-2017. Sub: TSSA Hyderabad - Swachh Vidyalaya Puraskar 2017-18 - Participation By All The Schools In The State - Finalize Short List Of Schools For District Level Awards - Identify Evaluators - Reg. 1. This office Procs. Even No. dated 21.09.2017 & 09.10.2017. 2. Letter No. F. 27-11/2017-EE-16, dated 25.10.2017 and 26.10.2017 of Govt. of India. 3. This office proceedings Re. No.3623/SS/\/R&F/2017 l).1tv Ill 112017. 5. This office Proc Re. No.3623/SSA/R&E/2017, dated: 23-11-2017. The attention of all the District Educational Officers & EO-DPOs of SSA in the State is invited to the references read above wherein instructions were issued for registration of schools for SVP 2017-18 on online and also issued guidelines from time to time on selection of schools for district awards and to compete Stale awards as per GOI instructions. In this regard they are informed that the date of selection process of the schools for the district level awards and to submit results to compete state awards has been extended to 31.12.2017. In order to complete the process in the stipulated period, the time line schedule is issued to all the DEOs & EO-DPOs of SSA in the State to follow scrupulously. • The process of nominating entries for the state level awards should be completed by 30th November, 2017. Instructions for DistrictOfficers (Web application) Click on the following URL for Login page http://swachhvidyalaya.com/login.aspx and click on the District login to view the window. The District would login selecting the respective State and District and login type as District Login . The district code is used as password can change after logging in. 2. List of eligible schools can be viewed in Evaluator Survey Dashboard Tab - category and sub category wise. The District will click on 'Field Evaluator- Register' and then click on 'Add Evaluator' button to register a field evaluator. The name, mobile number, designation and email id of the field evaluator should be given. These fields are mandatory.
" Field Survey Registration Completed Successfully. Your OTP is: 646840. Download Mobile App http://bit.ly/2bYwLOi. SV Puraskar MHRD"
Then on clicking the Submit button he/she will receive a One Time Password (OTP) on the registered mobile number that can be used by concerned Field Evaluator for logging in the website and/or the mobile app to upload his/her field evaluation report. The District can go to the tab of 'Evaluator Survey' to access the list of schools eligible for field evaluation that can be downloaded as excel files and assign schools to the different Field Evaluators. The District can go to 'Award Winners- Shortlist' to view the Field Evaluation scores vis-a-vis the self-assessment score of each eligible school. NOTE: As of now 2017 is not done. For reference we're displaying you 2016 Form. The District will select the schools and click on the submit button. Upon submission the list of award winners in different categories gets consolidated and can be viewed in the tab of 'Final List'. The process of selection and submission to the state would be completed by clicking on the 'Submit' button at the bottom of the page for every award category.